Build Out: Standard costs associated with converting a retail space into a coffee shop, including the plumbing and electrical setup. Equipment: This is the cost of essential coffeehouse equipment like an espresso machine and convection oven. Other: Expenses that don’t fit into the other categories, including the first month lease payments, labor expenses, and working capital. As you might expect, each coffeeshop or coffeehouse is will have a unique total startup cost. The cost is determined by a variety of factors that’s unique to each entrepreneur’s situation and goal. The square footage of the location, part of the country and city you plan to operate, and the equipment you choose are all examples of highly variable costs that go into determining the total startup cost. Tips for using this calculator and editing the startup estimate based on your unique situation is available below the online calculator. By default, we’ve filled in the cost estimates for each field based on a low-end to average industry average expense so you can use it as a guide. To get the most accurate estimate for your situation, enter data that’s relevant to your future business based on monthly lease quotes and the pieces of equipment you’ve priced out. You can get the results emailed to you for future reference or inclusion on your business plan by clicking the button located at the bottom of this calculator. We’ve also included this information in a spreadsheet at the bottom of this post that can be downloaded. We hope this free calculator will serve as a helpful resource when starting your own independent coffee shop! Coffee Shop: Coffee shops can be started between $100,000 on the low-end – $300,000 on the higher end. You can find similar estimates on price ranges from reputable sources like CrimsonCup.com and Investopedia. Coffee Truck or Trailer: Going mobile on a coffee truck can reduce your startup costs by more than half. You can also cut out the monthly lease expense by doing this. Ballpark this will cost about $50,000 – $75,000. Drive-Thru Coffee Stand: In certain areas of the country, drive-thru coffee stands have become popular. Due to the small space and being able to operate the business with 1 – 2 employees the startup costs are lower than corner coffee shops. Startup costs are between $40,000 – $100,000 typically. Coffee Kiosk: A coffee kiosk can be a lower cost way to open in a public place like a shopping mall, hospital, train station or other high traffic area. Generally speaking these are oven lower priced than a coffee truck and can be started for between $40,000 – $75,000. Coffee Cart or Catering: These are the lowest barrier to entry options. You could realistically start here as as a cottage food business for between $10,000 – $15,000. If you hustle and reinvest the profits you could scale into a larger coffee business in a short time period. 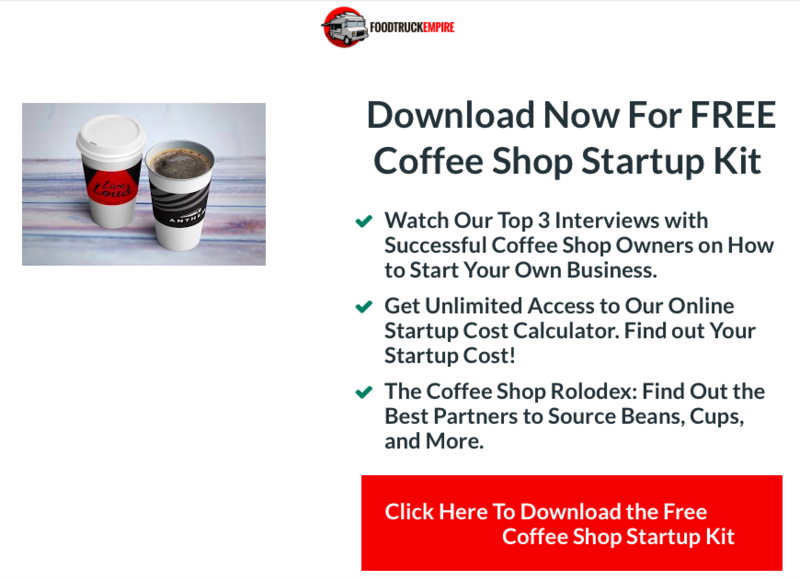 Here’s a direct link to copy and paste the columns and rows of your own coffee shop cost estimates into a spreadsheet. Below you’ll find a description and cost estimate of each line item. Plumbing You’ll need a professional to complete plumbing. Price Range: $5,000 – $6,000. Electrical You’ll will need a professional to complete electrical installation. Coffee shops require a lot of electricity to operate equipment. Price Range: $5,000 – $6,000. Counters Counters will wrap your coffee bar / equipment. Price Range: $12,000 – $20,000. Flooring Highly variable depending on square footage. Price Range: $5,000 – $10,000. Menu Boards Lists the prices and menu items for your cafe. Price Range: $1,000 – $5,000. Merchandising Displays For display food items (fruit, baked goods) or branded merchandise like cups and t-shirts. Shelving Stacking and organizing product like coffees / syrups. Alarm System Protect your business from bad guys. Price Range: $500 – $2,000. Permits, liscense, Plans Highly variable depending on location. Price Range: $2,000 – $3,000. General Construction Cost Buffer Costs generally run higher than you expect. This is a buffer for building expenses. Price Range: $5,000 – $10,000. of beverages. Price Range: $1,000 – $4,000. External Signage Marketing expense to help you location stand out. Fridge Keep milk, smoothies, fruits and other products cool. Price Range: $1,000 – $1,500. Fan Proper ventilation is needed for coffee shops. Price Range: $500 – $1,000. Cups Highly variable cost. Mugs or disposable cups? Price Range: $1,000 – $2,000. Espresso Machine and Grinders Grinding coffee throughout the day is important for best taste. Price Range: $7,000 – $17,000. Grinder Used to grind coffee beans. Price Range: $1,000 – $3,000. Convection Oven Warm up baked goods and other food. Coffee Brewing System Used to make standard drip coffees. Price Range: $2,000 – $8,000. Dispenser Immediate hot water with drinks. Price Range: $500 – $1,200. Two-Door Cooler May be needed to store food and drink items. Price Range: $2,500 – $4,000. Underbar Sink Fits under a counter. Extra hand washing location. Speakers Helps set the mood / vibe of your shop. Price Range: $600 – $1,500. Microwave Oven Worth having on hand for requests to heat up coffee, etc. Price Range: $200 – $500. disposable cups. Price Range: $3,000 – $10,000. Case Where you will display baked goods and menu items for sale. Price Range: $7,000 – $15,000. 3-Compartment Sink You will be required to install this for washing hands and equipment. Price Range: $500 – $1,500. Commercial Freezer Keep items frozen. Price Range: $2,000 – $5,000. Router For offering free internet access to guests. Price Range: $200 – $350. Blenders For smoothies and other blended specialty drinks. Price Range $400 – $1,000. Brooms / Mops Keep things clean! Price Range: $100 – $200. Vacuum Cleaner Keep the floors clean. Price Range: $300 – $400. Tables / Chairs Furniture for guests to be comfortable. Price Range: $2,000 – $25,000. Furniture May not be needed. Depends on location. Price Range: $500 – $4,000. Initial Inventory Coffee beans, syrups, cups, straws and other product. Price Range: $5,000 – $7,000. Initial Marketing Campaign Advertising to help get your name out into the community. Price Range: $2,000 – $10,000. Price Range: Free – $10,000. General Office Supplies Paper, pens, notepads, calendar. Price Range: $200 – $300. POS System / Cash Register How you accept payments from guests. First 3-Months Rent / Lease Payment Highly variable cost depending on where you’re opening. Price Range: $3,000 – $12,000. employees you plan to hire. Working Capital Money needed to operate business day-to-day. The more available dry powder the better. Total: Low-End Startup-up Cost Estimate $100,400. We hope this calculator and spreadsheet makes it easier to estimate the total startup cost of your dream coffee shop. Question about the cost estimates for this free online calculator? Drop us a line in the comment section below.